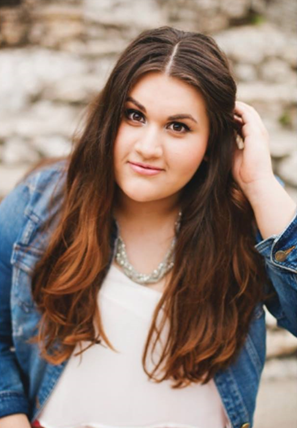 This week on “Meet the Intern”, we sat down with one of our fall Communications/Marketing Interns, Victoria Fuentes. Read below to learn about her hypothetical experience with “America’s Got Talent”, how she turns down Zac Efron, and her absolute favorite thing about Bryan College Station. I’m from Kingsville, Texas. It’s about an hour south of Corpus Christi and it’s home of The King Ranch. I went to school on The King Ranch all of my life. -If you were a contestant on “America’s Got Talent”, what would your performance be? I would probably attempt to sing (heavy emphasis on attempt) and I would just really go for it. I would probably wind up singing something super hard and totally out of my range like Mariah Carey or Whitney Houston. I am currently a communication major with a business minor. -What is your favorite song at the moment, and what type of pizza would you eat with the artist? My favorite song right now is constantly changing, but my favorite song of all time is “Juicy” by Notorious BIG and I would have to eat New York-style pizza with him, of course. -What do you do at the CVB? I am one of the Marketing and Communications Interns for the CVB, so that means that I help with posting on our social media, writing blogs, handing out fliers for games, etc. Basically anything in the marketing sphere, I help out with. 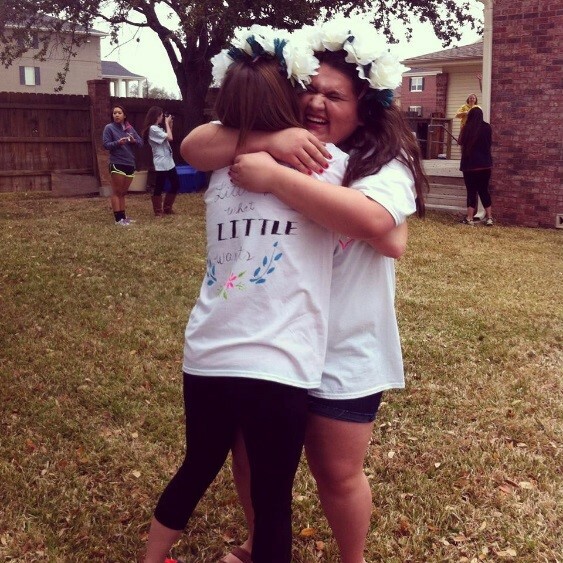 One of Victoria’s best memories: Getting her “PERFECT LITTLE”! -If you could have a picnic with any person living or dead, who would you pick and where would you go? I would have a picnic with Selena Quintanilla in a heartbeat. We would eat barbacoa tacos from El Chato’s in Kingsville and picnic on the beach in Corpus Christi. I would make her teach me how to do “the washing machine” and at some point we would break out singing “Amor Probido”. -What’s your favorite thing about BCS? My favorite thing about BCS is the small town feel with all the big town amenities. I grew up in a really tiny town where we had to travel an hour to get to a mall or eat something other than Whataburger, so I love having everything right at my fingertips. -If you could snap your fingers and travel to anywhere in the world, where would you go and why? Traveling to Paris during Paris Fashion Week has always been a lifelong dream of mine. The inspiration that designers draw from the famous city is incredible to see put into their designs and such beautiful works of art. I would also like to spend the rest of my life in The Louvre, please. 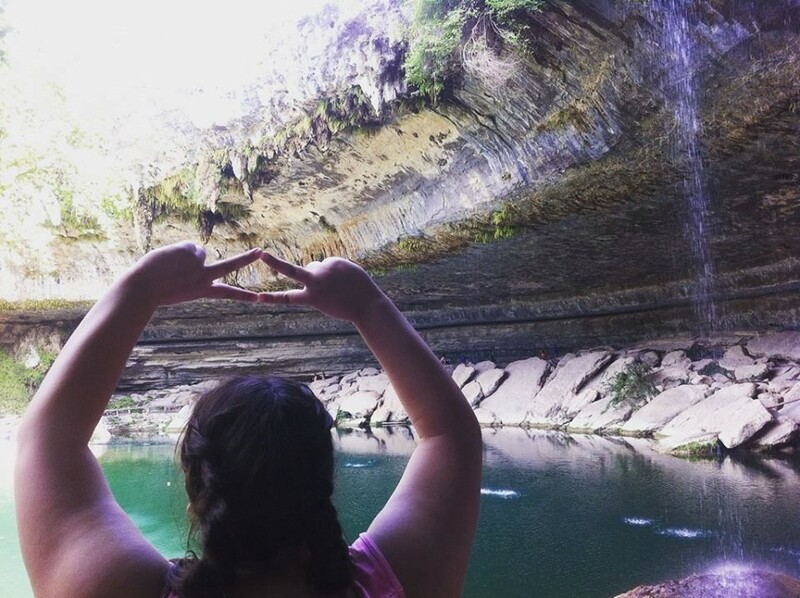 Victoria at her favorite place she’s ever hiked: Hamilton Pool. -What’s your favorite restaurant in BCS? Well, that depends on what kind of food we’re talking about. My favorite spot for a great cheeseburger is Blackwater Draw. For an amazing taco: Raspas de Payaso. And let’s not forget the holy grail of brunch spots: Hullaballoo Diner. I LOVE brunch. If you haven’t read my account of the best spots to brunch on Aggie Gameday do it. -What’s the best present you’ve ever received and what was the occasion? For my 13th birthday my dad gave me a silver and gold bracelet with “You Are My Sunshine” engraved on it. It meant a lot because he has always sang that song to me, even now that I am 20 years old. 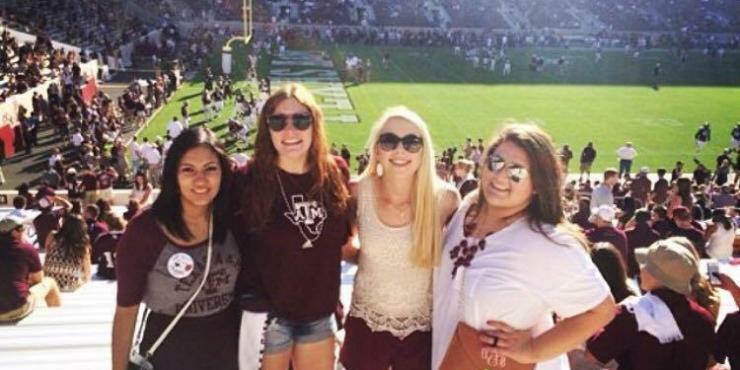 -Why did you choose Texas A&M? I chose Texas A&M University because it immediately felt like home. From the moment I stepped on campus for my first tour to this very day, Texas A&M has always felt like home. 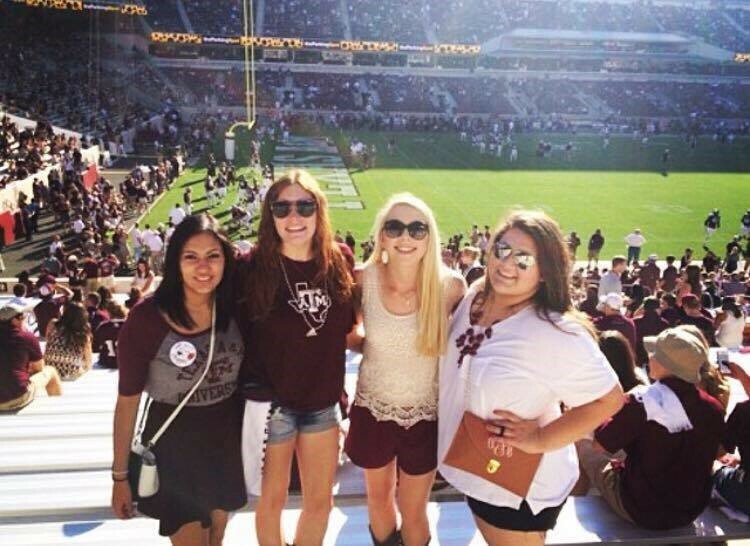 Victoria & her friends at her first Fightin’ Texas Aggie football game! -Would you rather go sky diving with Zac Efron or go on a shopping spree with Michelle Obama? Oh gosh, a shopping spree with Michelle Obama because I am TERRIFIED of heights. Sorry, Zac. Not to mention Michelle Obama has flawless style and I would love to have a glance into her closet. Next up in our “Meet the Intern” series for this fall is Madeleine Russell! Stay tuned!